I had a craving to make some sort of mango dish, didn't matter what, I just wanted mango. That's how this dish started- building the dish around one ingredient. That's a little bit like decorating a room around one vase. Sure it's possible, but a decorator would typically look at the room as a whole, figure out the style and the colors and continue to drill down from that point. I'm reversing the process - I'm starting with the vase and building up from there. So what to do with the mango? It was such a nice sunny day - which warranted bright, cool flavors that a mango salsa quickly came to mind, or some would call it mango relish or even mango salad; it's all the same. I added a few simple flavors like onion, cucumber and avocado, then a little jalapeno for taste. I needed a protein to go with this, and I didn't want a heavy red meat. Scallops seemed just right, shrimp would have worked well here too, but I thought the tenderness of the scallops would pair well with the mango. I debated between marinating them in a black tea or in tequila - tequila won hands down. Although I do like the black tea idea and will work with that soon. My dish turned out stylish, based on the 'vase' that set the tone. Seriously, the results were great - although I wonder if more tequila would have yielded a deeper flavor or if I needed to actually use a cheaper tequila? I had Patron on hand and used that but perhaps that was a bit too smooth... my suggestion is to just use whatever you have on hand and taste it, adding more tequila to your liking. You can leave the tequila out if kids are involved! But at the very least, mix a nice big margarita to go with your mango and scallops and be fat and happy! Combine the vinaigrette into the mango bowl and toss gently to coat. Set aside while you cook the scallops. Remove scallops from marinade and toss the marinade. You can grill or pan fry your scallops, I seared them in a pan on the stove. Use a medium high heat and simple fry until you have a light brown color on one side, and then flip over and do the same to the second side (just a few minutes per side.) You don't want to over cook them or they will become chewy and stringy. 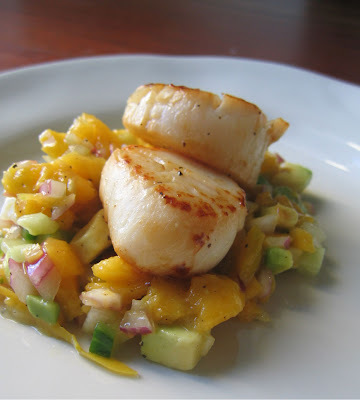 Place a scoop of mango salsa on the middle of a plate and pile the scallops on top. You can serve with a lime wedge. I love your blog! I just came across it while searching for some recipes. 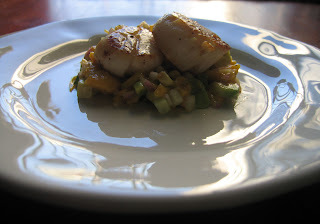 I was just wondering if you could suggest a recipe to dress up seared scallops, like a sauce of some sort? PS: the photos are great too! I hate finding recipes that don't have pictures to show me what I should end up with. Hi there- Thanks for reading Fat and Happy! Without knowing what else you're serving with your scallops, how about a classic roasted red pepper sauce? Take roasted red peppers, cook them in a bit of broth (or cream) with onions and garlic, a hint of lemon and then puree when it is all soft. Or take the mango relish on this recipe, again sautee until everything is soft and puree. Let me know if you have other flavors you'd like to work with or need more instruction on these! Thanks for the suggestion and sorry about my vagueness! Would you know of a good tomato-based sauce to go with the scallops? I once had a seared scallop appetizer at a restaurant and it was served with a tomato taragon creme (that's what the menu said). Any ideas on a similar-type sauce? Or maybe a Thai-inspired sauce? Hi again Ling- that does help narrow it down! I have some great ideas already a lemongrass, coconut and ginger sauce for one- I don't have all the ingredients right now- but I'll work on these recipes in the next week or two and post them! Check back! Thanks!